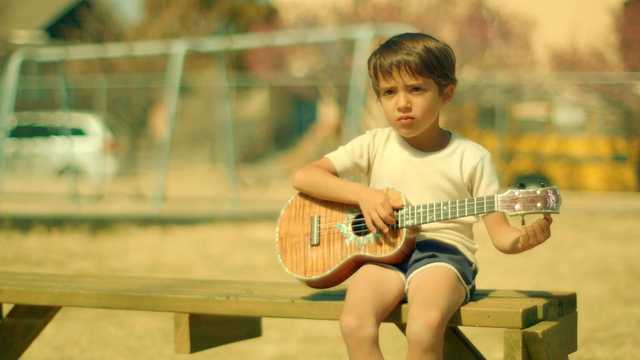 A cute kid composes and plays a song that moves people profoundly in "A Boy Called Sailboat," a very small movie that might turn the same trick for viewers who never get to listen to the tune at all. And that's the bizarre rub. The screen goes silent whenever "Sailboat" does perform the ditty his gravely ill grandmother, whom he calls his abuela, asked him to write for her on "that little guitar." What we can see if not hear, however, is the wave of real emotion on the faces of family, friends and strangers who do pick up its apparently life-changing melody. Sanchez plays "Sailboat" and his small guitar in a unique family film. The instrument is one of the many junky artifacts the boy often finds in the drought-ridden New Mexico desert that surrounds his ever-tilted family shanty (a standing joke -- excuse the pun -- in the mostly engaging film written and directed by Australian Cameron Nugent). Right from the start, though, "that little guitar" is what becomes something so special -- maybe magical even -- for the youngster whose own narration gives us an early clue. "My abuela says you find the most important things when you're not looking for them," explains Sailboat, so sweetly portrayed by newcomer Julian Atocani Sanchez. And then, along the way, his guitar song actually helps many in the story grab hold of dreams over a wide realm that includes horses, used cars, soccer, and spicy meatballs, of all things. The rest of a competent cast is headed by veteran character actors Noel Gugliemi, as Sailboat's supportive dad, and Elizabeth De Razzo, perhaps known most notably from HBO's "Eastbound & Down," as his quiet mom. Otherwise, two familiar names appear in what simply amount to funny, extended cameos. Jake Busey plays a snake-smitten teacher, and Oscar-winner J.K. Simmons, who opens the film by hauling a real sailboat into the picture, has one big scene that becomes the closest thing to off-color in this primarily gentle production. More prominent is the acoustic-heavy soundtrack (what else?) from the Grigoryan Brothers, guitarists performing a handful of recognizable offerings, such as "Scarborough Fair," repeatedly played in some unexpected places.